The story of Bravo Company, First Battalion, 26th Marine Regiment is a very personal tale of young men, untested, mostly new to Vietnam, who were trapped in one of the worst sieges in the history of American warfare. The siege of Khe Sanh was one of the salient conflicts of the American experience in the Vietnam War, and the young men of Bravo Company were asked again and again to stand up and fight under some of the most trying conditions of the lengthy war. And they delivered. Lasting seventy-seven days, this specific battle involved large, division-level forces on the North Vietnamese side and regimental engagement on the American side. Elements of three North Vietnamese divisions surrounded three United States Marine Corps regiments—the 9th, the 13th, and the 26th—along with supporting forces. An estimated 354 men were killed on the American side. Of those, more than 60 were Bravo Company Marines and corpsmen. One of Bravo Company’s major engagements during the siege, what has been called the “Ghost Patrol,” has been well documented, but other patrols, that of March 21, 1968 and the March 30, 1968 “Payback Patrol” are little known and largely undocumented. On the Payback Patrol, two Navy Crosses, eight Silver Stars, nine Bronze Stars, and Two Navy Commendation Medals with Combat “V” were awarded. Additionally, in excess of one-hundred Purple Hearts were awarded to wounded combatants, and this for a patrol that included less than one-hundred participants. A number of Marines and corpsmen received multiple wounds that day. During the four-hour fight, the marines of Bravo Company killed an estimated 115 North Vietnamese soldiers of the 8th Battalion, 66th Regiment of the 304 (Hanoi) Iron division of Dien Bien Phu fame. The battalion commander and his staff were among the dead North Vietnamese. Additionally, Bravo Company inflicted a large number of non-lethal wounds on their foes. 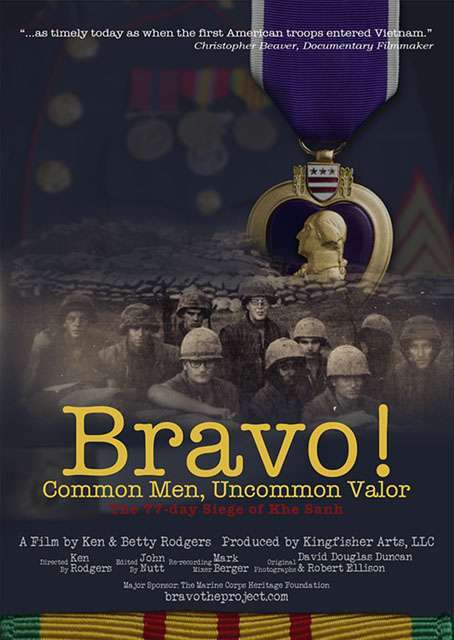 The story of Bravo Company and its aggressive Marine warriors is deeply explored and documented in this film, along with the general state of life in the siege trenches where they endured the agony of nearly constant enemy bombardment. Many of the marines who survived the siege of Khe Sanh are in their sixties and seventies and time is beginning to play out to document their memories, their stories. Now is the time. This independent documentary film captures their stories through filmed and recorded interviews, along with historic photographs, news clips and other media from the time of the siege. The stories are intertwined with other forms of media that creates a documentary capturing the fear, the suffering, the elation of war. Just boys when they arrived in country, the men of Bravo Company were tempered by fear and violence and when asked to do their jobs as marines, responded. Bravo! Common Men, Uncommon Valor documents their story. Thanks for the encouragement. You may very well be right about KIA/WIA figures. There are different numbers depending on the source. Do you have any suggestions about a more reliable source than the DOD? The DVD was sent to me by Marines that were also in Vietnam, Hue City, particularly Nicholas Warr, Author of PHASE LINE GREEN. I was so caught up in the emotion of the piece, I felt exhausted after it (and my wife who is a 24 year vet of the Navy). I made a comment and posted your DVD on our page for our film, Mirage at Zabul Province, pushing them to your site. I hope this helps, Social Media can really help the cause. If you or anyone on Bravo are in the LA area, our Red Carpet Premiere is July 7th, Sunday, at The CINEFAMILY THEATER, West Los Angeles at 611 North Fairfax from 2:00PM-4:00PM. Would love to have you or anyone from your organization present. Please you or anyone join us and RSVP me at mroling@hiungrydreagonfilms.com. We are involved with Wounded Warrior Project as well, and are considering Nick’s PHASE LINE GREEN as a feature film from the book. Maybe somewhere in all of this is a tie-in with you at Bravo. Let’s try that again, shall we, (fingers too big for this HP/Mini), mroling@hungrydragonfilms.com. Immediate members (Betty & Ken), authors, producers & Director of the DVD please, limited space. Thanks! Thank you for doing this film.